A national cooked nutritious mid-day meal scheme to be introduced in primary and secondary schools across the country. To raise public spending on health to at least 2-3% of the GDP over the next five years, with focus on primary healthcare and to around 5% of GDP over the next decade. A national scheme for health insurance for poor families will be introduced. To step up public investment in programmes to control all communicable disease and also provide leadership to national AIDS control effort. To take all steps to ensure availability of life-saving drugs at reasonable prices. To introduce a new community anchored health worker scheme and implement it with the involvement of people’s organizations and panchayati raj institutions. NHRM seeks to reduce the Maternal Mortality Ration (MMR) in the country from 407 to 100 per 1,00,000 live births. The Accredited Social Health Activist (ASHA) is the essential link between the community and the health facility. A trained female community health worker –ASHA –is being provided in each village in the ratio of one per 1000 population. Janani Suraksha Yojana is a safe motherhood intervention under the NRHM being implemented with the objective of reducing maternal and neo-natal mortality by promoting institutional deliveries. A bill to set up National Commission for Human Resources for Health (NCHRH) has since been finalized and has been introduced in Parliament. The NCHRH is envisaged as an overarching regulatory body for the health sector, to reform the current framework and to enhance the supply of skilled personnel. 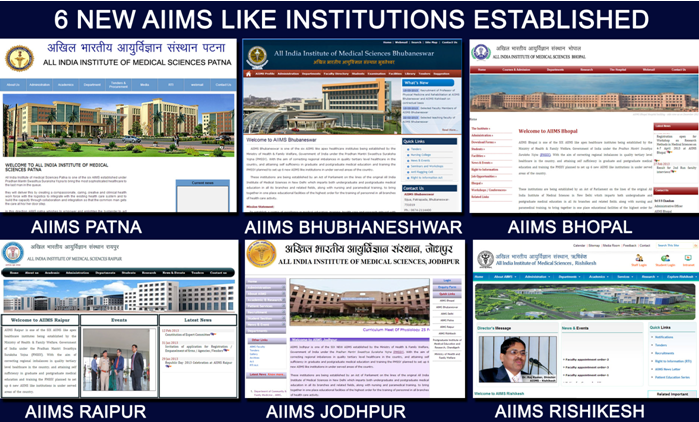 Pradhan Mantri Swasthya Suraksha Yojana envisaged construction of 6 AIIMS-like institutions in the first phase at Bhopal, Bhubaneswar, Jodhpur, Patna, Raipur and Rishikesh. The overall goals of NACP-III is to halt and reverse the epidemic in India over the next 5 years by integrating programmes for prevention, care and support and treatment. AYUSH – financial assistance is provided to States/UTs as recurring grants AYUSH facilities at 4090-Primary Health Centres (PHCs), 350-Community Health Centre (CHCs), 136-District Hospitals (DHs) and as Non-recurring grants for three PHCs, two CHCs and one District Hospital. Financial assistance was also provided to 15,680-AYUSH Dispensaries and 155 –AYUSH Hospitals for supply of essential drugs. 6 proposals for setting up 50-bedded Integrated AYUSH Hospital and 5 proposals for setting up 10-bedded Integrated AYUSH Hospital have been supported under the Scheme in the North-Eastern and Other Hilly States of Jammu & Kashmir, Himachal Pradesh and Uttarakhand. The Transplantation of Human Organs (Amendment) Act 2011 has been enacted incorporating the inclusion of grandparents and grandchildren in the definition of near relatives, recognition of retrieval centres and approval of paired donor exchanges, making it mandatory for the treating staff to request relatives of brain-dead patients for organ donation. Health Research – 22 Institutions have been granted funds under a scheme to promote human resource development in cutting edge areas viz.,Toxicology, Genomics,Proteomics, Geriatrics, Stem Cell Research, Clinical Trials, etc. Since the launch of the National Rural Health Mission, over 1.57 lakh personnel have been added to the health system during 2005-12. Infrastructure has been strengthened by taking up 594 District Hospitals, 2,721 Community Health Centres, 5,459 Primary Health Centres and 31,001 Sub-Centres for new construction or renovation. 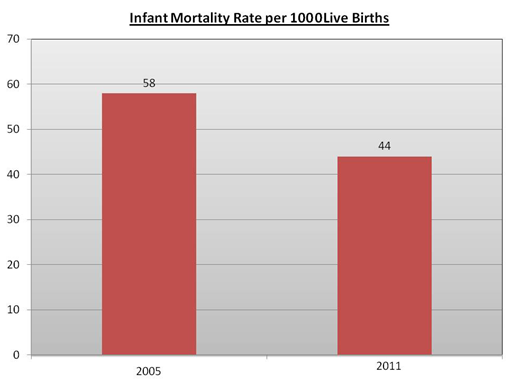 The Crude Birth Rate (CBR) at the National Level at 22.1 in 2010 declined 1.7 points over 2005-12 The Crude Death Rate during the same period ndeclined by 0.4 points. A total of 70,000 beds have been increased in government health institutions for provision of essential and emergency services. No polio case has been reported in the country since January 2011 owing to immunization drives. The World Health Organisation has taken India out of the list of polio-endemic countries. 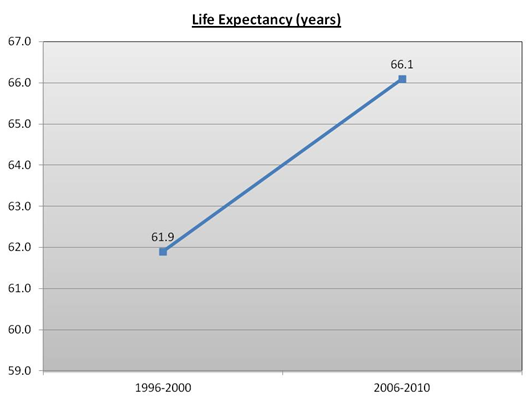 Mortality due to Kala-Azar has shown a declining trend. The total number of reported Dengue cases was also lower in 2011 as compared to 2010. HIV – The numbers of new annual infections have decreased by 56% over the past decade and the epidemic has begun to stabilize. NACP- III has been acclaimed globally as a successful programme. 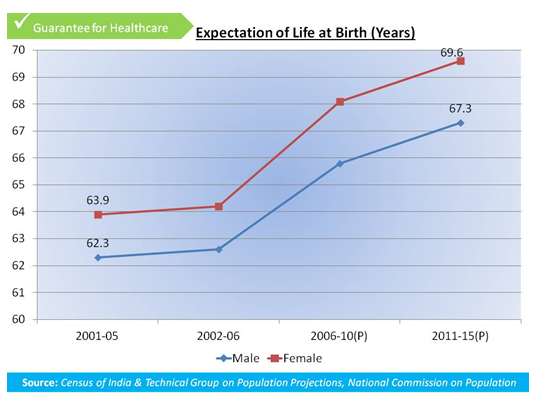 The Ministry of Women and Child Development, Government of India, came into existence as a separate Ministry with effect from 30 January, 2006. Under Integrated Child Protection Scheme – 548 Child Welfare Committees and 561 Juvenile Justice Boards have now been established. There are 13.71 lakhs as on January 2013. 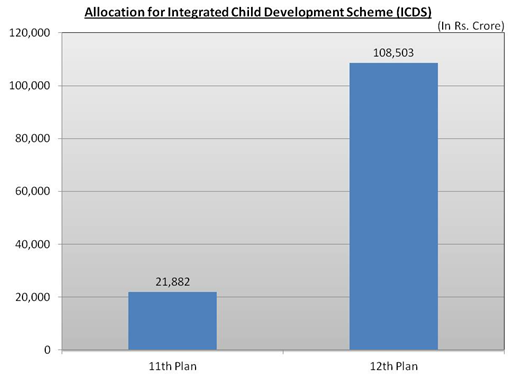 The restructured and strengthened ICDS is been Anganwadi centres rolled out in 3 phases with focus on the 200 high burden districts for malnutrition during 2012-13 and additional 200 districts in 2013-14 including districts from the special category States and NER and the remaining districts in 2014-15.